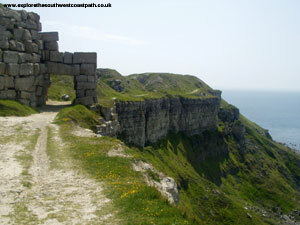 Although not officially part of the South West Coast Path, there is a coastal path around Portland, and it is also mentioned in the official guide to the South West Coast Path, so it seems natural to include it. 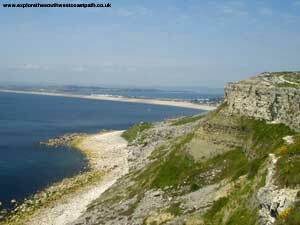 This walk starts from the well-known Portland Bill Lighthouse on the Isle of Portland and follows the Portland Coast Path round the west side of the island. 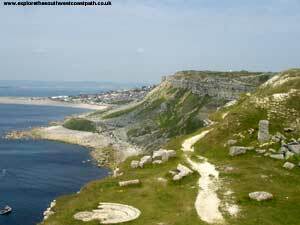 The path runs at a high level around most of the island, and goes through an area that is well quarried. 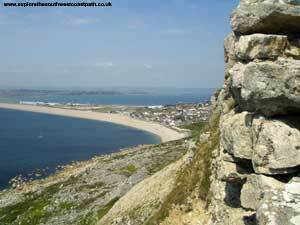 From Portland there are stunning views over Chesil Beach and The Fleet to the West. 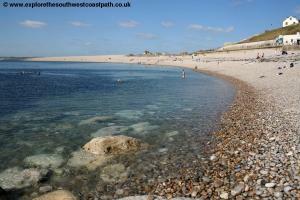 The path then drops down to the beach where there is a section walking next to the busy road into Weymouth. A short distance out of Portland and you can walk on a path next to the road over an old railway line. 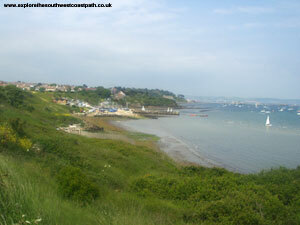 The coast path then joins the South West Coast Path at Ferry Bridge, the bridge linking the island with Weymouth. 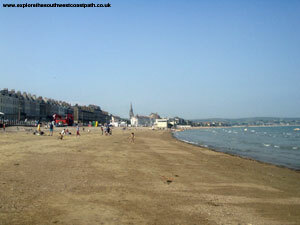 The path then goes through the suburbs of Weymouth, past Nothe Fort and over the bridge into Weymouth, where there is an excellent beach. 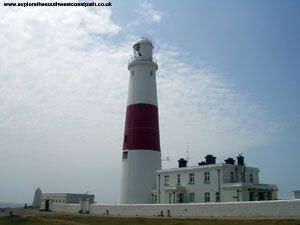 Portland Bill is the southern most point of the Isle of Portland. 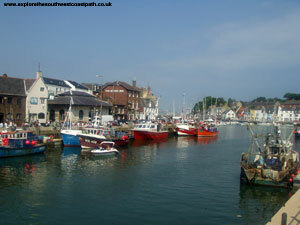 Portland is reached on the A354 from Dorchester and Weymouth. A new route for this road is currently under construction, the existing route gets very heavily congested, particularly north of Weymouth. Once on Portland there are good signs to Portland Bill. 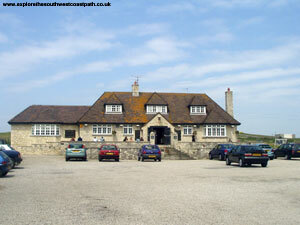 There is a large pay and display car park at Portland Bill, just next to the lighthouse. There are bus services to Portland Bill. In the summer months an open-top bus service links Weymouth with Portland Bill, however there are no single tickets available on this service, you must instead purchase an expensive "all day" ticket which is a shame. 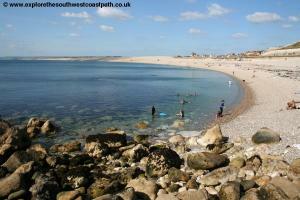 There are also other routes providing a limited all-year service to Portland Bill. 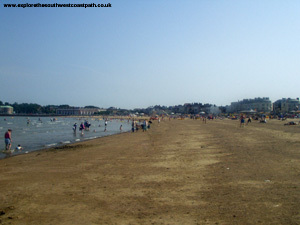 There is a large range of accommodation in Weymouth and there is a good tourist information centre on the sea front that has details of local accommodation, and runs a booking service. 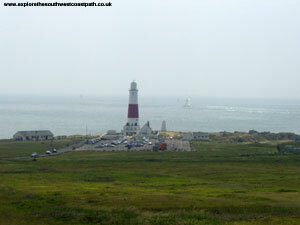 The choice of accommodation on Portland is more limited, but the links below provide information on accommodation in the area. 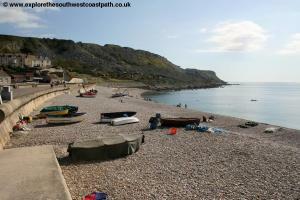 Part of the coast path between Blacknor and Chesil Cove is currently closed. Please follow the signed diversions. 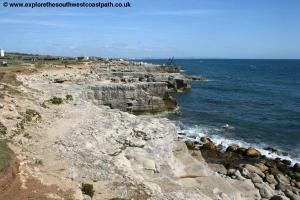 Portland is well known for it's stone and is the sight of many quarries, some of which are still active. The stone has been used in many buildings, but the most famous is St Paul's cathedral in London. 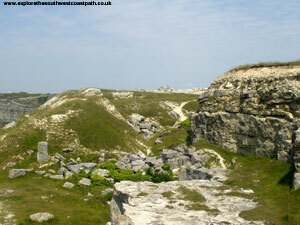 Much of the island is now scarred with the remains of the quarrying work. The island is also well used by HM Prison service, with two prisons and a young offenders institution on the island. 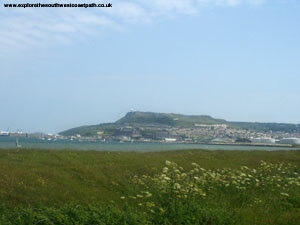 The island is also quite heavily used by the Military and Coastguard especially on the north of the island. 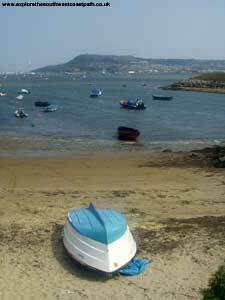 There are also several fairly large towns on the island, so it has quite a diverse landscape. 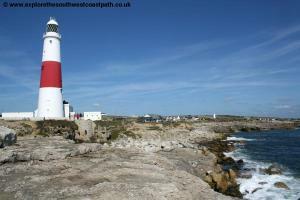 This walk starts at the famous Portland Bill lighthouse, at the southern most point of the Isle of Portland. The lighthouse is open to the public most days, except Saturday. There are superb views from the top. 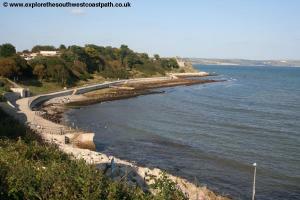 The coast path is signed on a stone in front of the lighthouse, but turn right as you face out to sea. 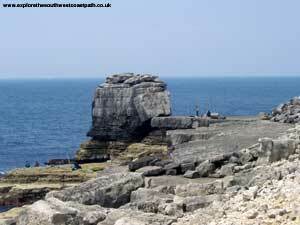 You soon get to Pulpit Rock, a large rock, now left as a monument to past quarrying on this part of the island. The path doesn't immediately join the coast, so instead you must walk along the grass next to the road until you pass the Pulpit Inn, near a row of cottages across the road. 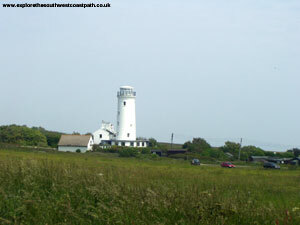 The path is a bit difficult to spot once past the pub, but just stick between the military buildings and the coast until it reaches the coast, where there is another small lighthouse. 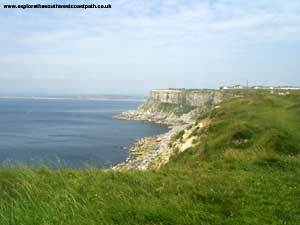 From here you can enjoy views back to Portland Bill and ahead to Wallsend Cove. The path passes the ugly Southwell Business Park after which you get good views of Mutton Cove and Blacknor ahead. At Blacknor there is a path down to the rocks below, which seems to be well used. 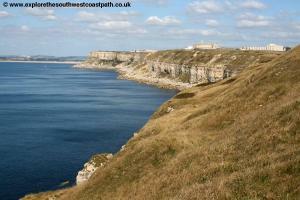 The views from here are excellent, especially when looking back towards Portland Bill. The path is sandwiched a bit here between some buildings and the edge of the cliff so it's quite narrow, but then becomes wider again once past the fence. 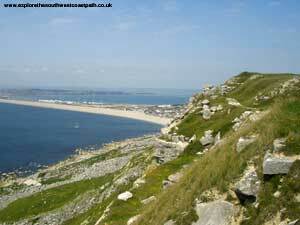 There are superb views over Chesil Beach to the West. 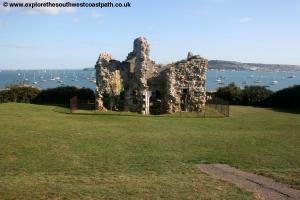 The extensive quarrying of the island is very much in evidence as you head north from Blacknor. 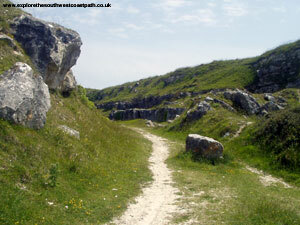 There are paths through to the remains of quarries inland and the coast path itself passes through an archway made of stones from the quarries. The views from this part of the path are probably the best of all, with the spectacular headland behind and Chesil beach stretching out to the left. After a period of high-level walking, the path starts to descend as you come towards Fortuneswell, the largest town on the island. The path descends past rows of houses on the right, and comes out by the beach. There is a small concrete promenade, with a pub next to part of it. You need to walk round the front side of the pub and then stick to the pavement next to the road. This part of the path is not especially pleasant as it's a fast and busy road. To the right is the new Osprey Quay and National Sailing Academy, to be used as part of the 2012 Olympic Games, replacing the older military buildings. Although you can walk along the beach, it is very hard going. Once past the new buildings on the right you can cross the road and walk on the old railway line, which is an easier and quieter walk and gives good views of the huge harbour. Soon you'll pass a car park, toilet and small visitor centre on your left as you approach Ferry Bridge. 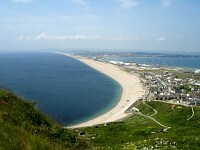 Portland is only connected to the mainland by this single bridge and Chesil Beach. Cross the bridge and then, turn right when signed, onto the South West Coast Path. The rest of the path into Weymouth is mostly on the edge of the residential areas, and for a time, along the residential streets. There are excellent views of Portland and the harbour for much of the walk though. There is a small park near Castle Cove where there are the remains of Sandsfoot Castle which is worth stopping to look at. 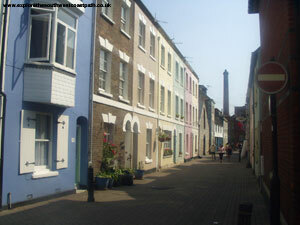 Once past the Castle it is walking along residential streets all the way until you get to Nothe Point. It is fairly well signed though, so you shouldn't go wrong. 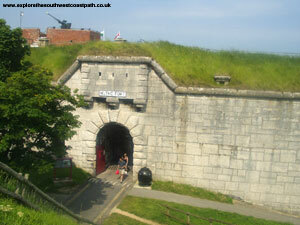 Nothe Point is an attractive grassed area, with a fort at the end, which is open to the public. 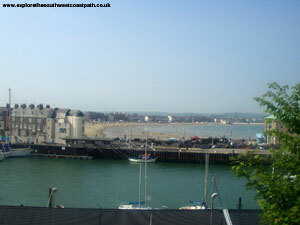 As you walk round the headland you get good views of Weymouth ahead. 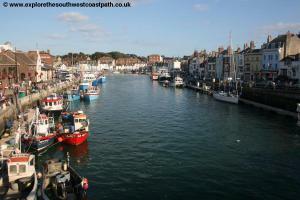 The path then descends from the headland to the harbour area at Weymouth. Once on the harbour side you can either follow the path round to the swing bridge or (if it's running), use the ferry across. 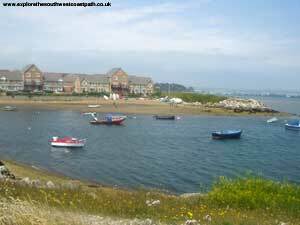 The walk inland over the swing bridge is recommended though, as the harbour area is very attractive and there is always plenty to see. You might have to wait to cross the Swing Bridge over the harbour, as it seems to be lifted very regularly. Once across the bridge, you are on the edge of the shopping area of the town. You can either turn immediately right and down to walk along the harbour side until you come to the ferry terminal, or walk along the shopping street and then turn right after a short distance onto one of the roads that goes to the sea front. 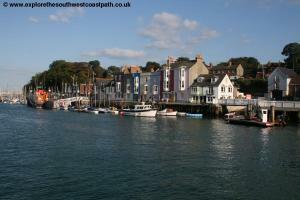 Weymouth has a very attractive sea front, with lots of traditional buildings and a clock tower part of the way along. The beach is excellent, with very fine sand and lots to do. It has a Seaside Award and so should be clean and safe and being east-facing is generally quite sheltered. 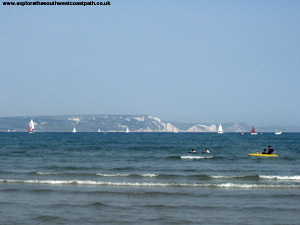 Out to sea you can see the white chalk cliffs around Lulworth ahead. 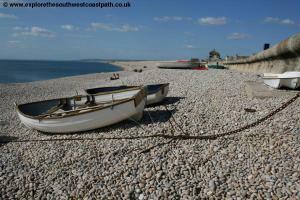 The beach does gradually turns to shingle as you head further North though. During the summer months there is an hourly service from Weymouth back to Portland bill, usually using open-top buses although you must purchase a special ticket for this bus (single tickets are not available) which makes it fairly expensive. In the winter months services are more limited. For details see the two links below. Ordnance Survey Landranger map 194 cover this area of the coast path and is available from most book shops nationwide. It is also stocked at the Weymouth Tourist Information Centre. 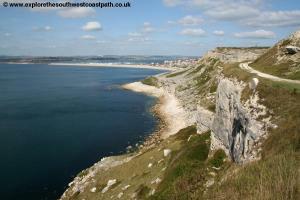 Multimap is a web site which provides maps of the UK, including around around Portland and Weymouth. 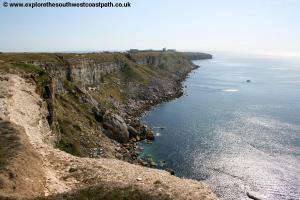 The links below will be of most use to the coast path from Portland Bill to Weymouth and the maps join to provide the complete coast path between these two points.